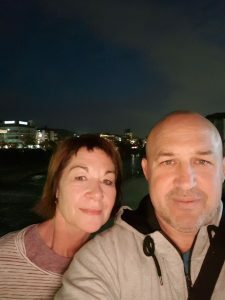 In my last post (can we link) I’d quickly concluded I loved my new professional coaching role with Kyoto Sangyo University in Japan! 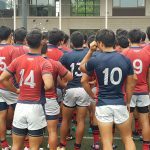 But I also mentioned there were already some very real challenges like my poor language skills, isolation from family and friends, and just the way Japan rugby works. The whirlwind has continued as we dived into our competitive season in the Kansai University League. Thanks to some close wins we’ve been successful in our Kansai League having won 6 from 7, so finished second to last years national semi finalists Tenri University. 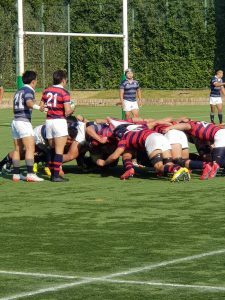 That qualifies us as one of the Top 16 university teams into the 54th All Japan University Championships, sudden death playoffs which takes place from mid-December to early-January. I get the impression the Kanto League, comprising Tokyo clubs, is generally a tougher competition so I look forward to testing ourselves against the top qualifiers from the other regions. Our in season routine has settled into morning gym sessions (1.5hrs) and then evening training sessions (usually 2.5hrs plus). That happens every day of the week except game day or our one day off a week! As coaches we’re also reviewing and scouting, and completing 1:1s with players as required, so there’s no shagging about. Coaching to an audience who speak another language continues to be a huge challenge. To help I’ve dived into learning ‘Nihongo’ (Japanese language) through self study on pod casts and twice weekly classes at the University. I’ve really enjoyed the mental stimulation of studying a new language, though realistically I haven’t yet progressed past the 101s such as greetings and ordering food (‘hanbaaga, kudasai!’). 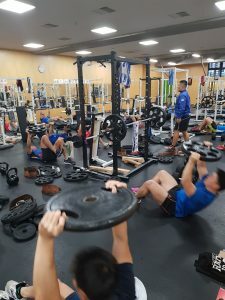 But through a mix of mime, the patience of multilingual staff like our physio Awaji Yasuhiro, and key rugby phrases (totemo yoi – very good, zenzen dame – not good at all, hikui mama – stay low) we seem to get through. The lows have been when I’ve made sessions overly complex leading to confused stares and inactive participants. A recent high was when I got to run a full training of the freshman teams (49 players) without the other coaches or an interpreter; you can bet we went shorter and more games that day! Another challenge has simply been isolation from family and friends. It was a long 3 months before my wife Tania was able to visit in October, but great to share tourist adventures when she did get here. Of course technology helps, making video call catch ups with friends and family easy. I’ve also been lucky to have connections in the rugby community who understand this isolation and reach out to support; quick chats or the occasional facebook from ‘been there done that’ guys who are naturally positive blokes like Filo Tiatia or Afa Hanipale make a big difference to your day. The other big challenge is that things just work differently in Japanese rugby. 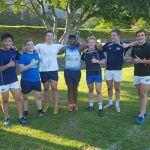 Talking to other rugby folk some of the differences sound common – preference for long trainings with high contact and high repetition – while some differences probably depend on the particular club situation. I’ve been lucky to be guided in this by our head coach Yukio Motoki, a Brave Blossoms and Kobe Steel legend at centre, with 79 caps and 4 World Cups on his resume. 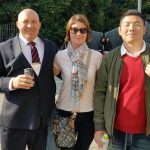 Despite his capability most decisions at our club require sign off by our Director of Rugby, Onishi sensei. Onishi sensei with 42 years in the role can rightly claim to be the driving force at this club. He’s very clear on his priorities for play and unlikely to be swayed from them, preferring a simple direct approach where good performance comes from players trying as hard as they can. As a result we are famous for driving every lineout (!) and physical repetitive scrum trainings focussed on controlled driving. Suggestions to make significant changes are unlikely to be persuasive. In practice this can be frustrating; can’t they see the opportunity if we did it this way instead? What I’ve realised is that some in Japanese culture can have a different view of what constitutes a good opportunity. They seem to question whether it really is an opportunity worth pursuing if it might not be a longterm solution (i.e. won’t we soon change again)? And even if it is, what’s the rush, wouldn’t it be better to chip away at it? Overlay this with the need to prioritise respect for those older or in authority, who may already have their preferred methods, and it can seem closed minded or intractable to a newbie like me trying to influence certain changes. This has required me to work differently; be patient, look to plant seeds not chop trees. To always be ready with good supporting information if ever I did want to push an issue. To show respect by finding ways to let them front any initiatives. Once I focussed on these approaches I’d often see our Sensei come back a couple days later and implement an idea he may have initially appeared to disagree with. The other part of influencing change here seems to be to take care with relationships. Filipe Rayasi, the ex-Fiji Rugby and Japanese top league star, made a throw away comment to me at just the right time “hey, over there make sure you turn up every day with a smile on your face”. So Filipe! But actually a perfect reminder for a time when I was tired and frustrated and it was probably showing. The simple change of making sure I appeared cheerful and engaged visibly led to me being sought out on issues and more actively involved. Probably I just appeared more approachable and supportive! 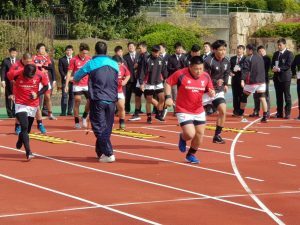 Our focus now is preparing for the All Japan University Championship this month. 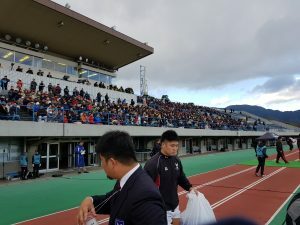 I’m pleased Ritzumeikan University has made it through as well with their coach staff including my friends Katsu Takeuchi and Daisuke Akai who have both featured in Wellington rugby. Add Tania’s next visit, my first Christmas here, and further learnings about University rugby in Japan and I expect an exciting month! I’ll let you all know how that goes in the New Year – Toki up! !